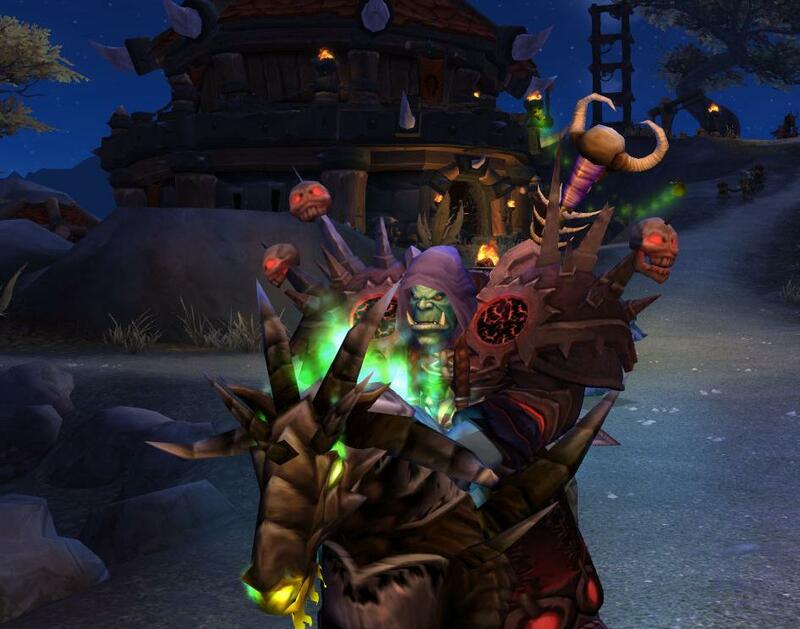 All across Azeroth, warlocks are looking up to one of the most influential warlocks of our times, Gul'dan. His influence has been felt for several expansions and even plays a major role for the next years to come. Elkagorasa has started collecting pieces to put together a similar set. Here's where he's at so far. Nice look, but won't pass for Gul'dan. Chest, Gloves and Shoulders of the Corruptor raiment (we actually are sporting the T5 Warlock set). The shoulders miss out on the wrath style glyphs on them, but definitely have the skulls on barbs going for them. Head: Nightsky Cowl - which I actually like this better than the corruptor head piece. Belt: Primal Gladiator's Cord of Prowess - this is a PVP piece that sells for 1750 honor. Main hand: Headmaster's Charge which is an heirloom item. Not a great coloring, but the extra skull adds nice flavor. Have to try out some cosmetic enchant on it to add flavor. Run Scarlet Monastery (or keep checking AH) for cowl. The Consortium Hood that I have equipped (below) isn't the right color. Decide on a back piece. I currently am trying out the Drape of the Faceless General, just because it's dark, but sort of liking some of the PVP Primal Gladiator's Cloak of Cruelty for its torn bottom hem. Go kill Leotheras the Blind for chance at Gloves of Corruptor token. Find a nice gloomy enchant to put on staff. It currently is showing something too cute (spinning green ball of happiness). Champion's Dreadweave Mantle - This gives the impression of glyphs on the shoulders, and the spikes off the top, but no skulls. The warlock version of these shoulders are red, so it would require going mostly red for other parts. These are purchasable for gold from a vendor in Netherstorm. Dark Coven Shoulderpads - These give the layered effect of his shoulders, and a band of obvious glyphs, but no spikes at all. Sadly, they are bright blue..The base version are purchasable for 165 gold in ICC.